The month of May is National Asthma and Allergy Awareness Month. According to the Centers for Disease Control and Prevention, about 25 million people have asthma. To raise awareness about the issue, every May resources and tools are spotlighted to improve the quality of life for asthma suffers. While you focus on breathing easier, your dentist in Fayetteville, NC can help promote your oral health. When living with asthma, it can lead to certain dental complications, like tooth decay. To protect your smile, it is best to include your dentist as part of your treatment plan. Those who have asthma tend to breathe through their mouths. In addition, the medical condition is treated with certain medications, like corticosteroids. When the medications are combined with mouth breathing, it can lead to decreased saliva flow. This can lead to dry mouth. When the mouth is too dry, there is not enough saliva to cleanse the teeth. As a result, bacteria in the mouth will grow as it becomes drier. This raises your risk for tooth decay and bad breath. In addition, this can also lead to gum disease if you are not proactive about your brushing and flossing habits to remove the bacteria. Tooth decay and gum disease are not the only oral health concerns for asthma sufferers. 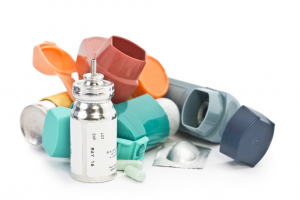 The use of control or rescue inhalers can irritate the roof of the mouth. As a result, a lesion can develop, which may become infected if it is not treated. In some cases, it may even spread to the throat or other areas in the mouth. When living with asthma, regular care from your family dentist in Fayetteville, NV is vital to protecting your oral health. Unfortunately, many people who live with the condition are hesitant to visit their dentist due to anxieties about the oral health issues that they are facing. As a result, the anxiety can further trigger asthma symptoms. To help you feel at ease, choose a dentist who caters to patient comfort while also remaining well-versed in treating patients with asthma. When visiting your dentist, be sure to tell them about your condition and the medications that you are taking. In addition to dental care, remain proactive about your oral hygiene habits at home. Be sure to brush your teeth twice a day and floss every night. After you use your inhaler, rinse your mouth with water. While you work to live a better life by controlling your asthma, do not forget about the health of your smile. Contact your dentist today to create a treatment plan to protect your teeth and gums from damage. Dr. Angela C. Ruff provides comprehensive dental care to the community, even those who have medical conditions, like asthma. She will help you promote a healthy smile with a customized treatment plan. If you need a cleaning and checkup, contact our office today to schedule your consultation.